In Rezku POS Back Office you can view a log of employees clocking in and out, and labor cost from their hours. To view Time Cards, log into Rezku POS Back Office. ● On the left side navigation column click on Users, then Time Cards. The shift periods are logged in chronological order based on clock-in time. The number of hours worked in the period is listed under Hours. Earnings are based on the rate of pay set for the User. To change this value, go to Manage Users. ● To audit an employee's timecard, click a Start time or End time. A window pops up with the image taken when the employee clocked in or out. As an owner or manager, you may have to correct times or manually enter shifts for employees. To Edit a clock time, click the pencil icon on the row for the entry you want to edit. The Edit Time Card window appears. ● Change the time and Click save. 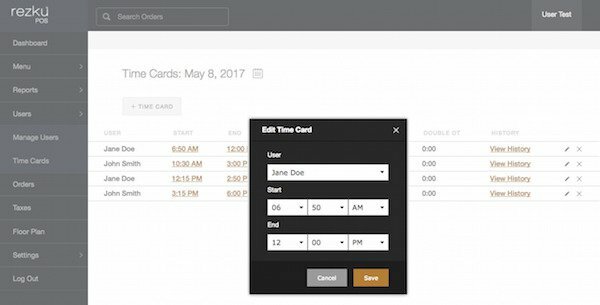 ● To add a time card click the + Time Card button. 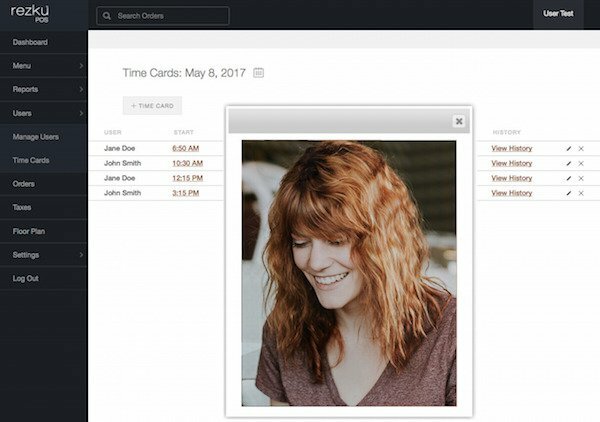 A window opens that’s just like the Edit Time Card window. Fro here, choose an employee name (user) and enter the start and end time manually. Click Save when you’re finished. 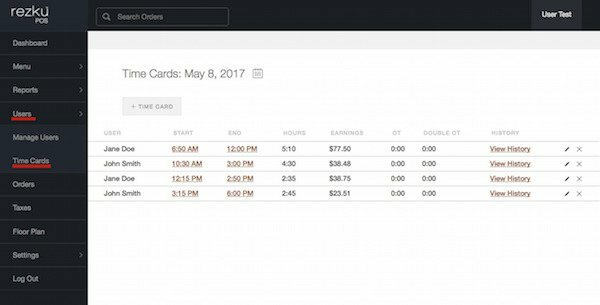 A record of the changes made to a Time Card can be found by clicking View History. The clock edit History window appears. In this example we see the original time clocking out by the employee and that the manager later adjusted the time. The log shows when the edit was made and by which account.